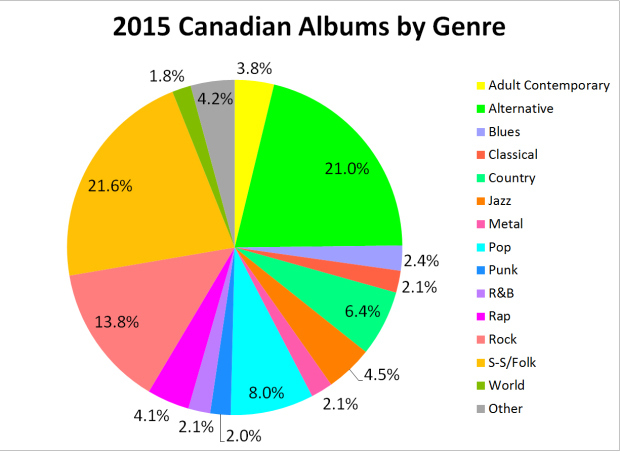 Canadian Music Blog put together a pie chart of Canadian album releases by genre for 2015. I’m not sure where they got the amount from, but let’s trust them. Of 661 albums (LPs) theytracked, theycame up with percentages based on genres. As you can see, the genre of choice for Canadian recording artists was singer – songwriter or folk at 143 of the 661 or 21.6% of the total. Close to that was alternative at 21.0% or 139 of the albums. The “other” category includes holiday albums, children’s, dance, reggae, and OST/musical. So, Canadians continue to be a country standing on the cusp of Neil Young, Joni Mitchell and Leonard Cohen-inspired rock and roll and folk singers, blazing across the planet of popular music.